The garage is one of the more integral “rooms” in the modern house, yet it tends to be forgotten about regarding design and organization. If you want your garage to be a functional and practical space, you must be purposeful in how you approach the design. The garage is designed to be a multifunctional space, but its primary purpose is housing vehicles and protecting them from the elements. Unfortunately, the garage also tends to be totally underutilized. Approximately one in four Americans say their garage is too cluttered to even park a vehicle. People take a tremendous amount of pride in their homes and spend thousands of dollars on renovating kitchens, decorating living rooms, and keeping living spaces functional and modern. But it’s almost as if the garage is the redheaded stepchild of the modern house. Many Americans are too embarrassed to even open their garage doors because of what the neighbors may think. The garage door is the largest moving mechanism in your home. It’s a massive system that needs to be thought about functionally and mechanically – not just aesthetically. For a garage door to operate correctly, it needs elements like the door, frame, tracks, brackets, rails, rollers, hinges, pulleys, and cables to work together. 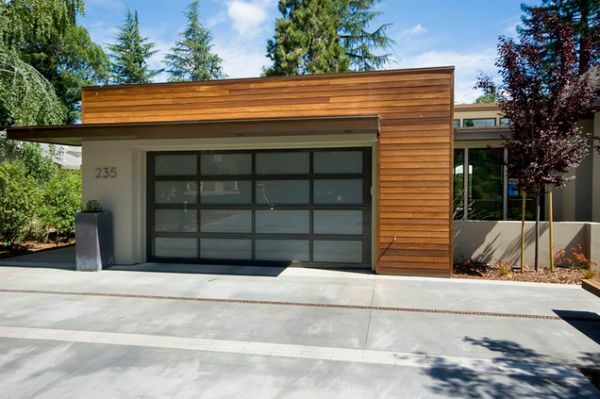 A good garage door provides seamless operation and somehow looks sleek and sophisticated at the same time. Before anything else, do your research and find a garage door system that’s both reliable and generously warrantied. One of the best suggestions for organizing a garage is to divide the space into zones. Each zone has a purpose and function, which allows you to give every item a home. The zones you choose will depend on your needs, but common categories include grab and go (things you frequently take with you when leaving the house), everyday items (toys for the kids, pet food, etc. ), garden and hobby equipment, long-term storage, outdoor and yard equipment, and workstations. Space is at a premium in the garage. Your vehicles will take up the majority of the room, and you don’t have the luxury of wasting floor space. To maximize the storage capacity of your garage, go vertical. “The greatest value in the garage is overhead storage,” says Gus Gougas, president of Los Angeles-based OrganizIt. It’s ideal for things you touch just a few times a year. Items like holiday décor and seasonal equipment would fit this bill. There’s nothing worse than having dark spots in your garage. Not only does it make it hard to find the things you need, but it can also be a safety hazard for you and your vehicle. Whether it’s tripping over cords or running over expensive equipment, poor lighting will eventually come back to bite you. When setting up your garage, develop a strategic lighting plan to cover the entire area. Think about the differences in lighting when vehicles are present versus when the garage is empty. Finally, think about accessibility. To make your garage functional, you must be able to access the items you need – even when cars are inside. Leave room around the perimeter of the garage and in between vehicles. Otherwise, your garage will quickly become unusable. When thoughtfully designed and organized, the garage can become one of the most versatile and appealing spaces in your entire house. Stop treating your garage as a receptacle for all of your junk and start giving it the attention it deserves.